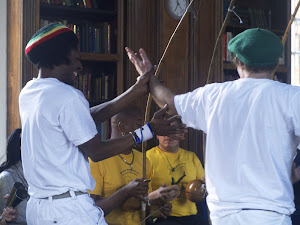 Capoeira Angola - South London: Class is cancelled this Monday (28th) and Wednesday (30th). Back to normal on Monday the 4th. Class is cancelled this Monday (28th) and Wednesday (30th). Back to normal on Monday the 4th. This coming week Vitoria and I are in Italy -visiting a friend and also going to Mestre Valmir's workshop (take a look at http://capoeirangolapisa.jimdo.com/). Once Goia is back he will be talking more about the experience and organising events to disseminate the tour and its objectives further. But for these reasons class is cancelled this Monday (28th) of November and Wednesday (30th). Back to normal on Monday the 4th. It also means as both Toca and all of us will be away there will be no roda at the end of this month.